Happy Halloween. Here’s the trailer to one of the scariest movies I have ever seen. I know people are split on this one– you either love it or hate it. Released in 1999, the actors filmed it themselves with a Hi-8 and a 16mm B/W, and managed to capture some truly impressive visuals. With minimal scripting and no special effects, the film plays off the best Hitchcockian idiom that what you can’t see is often much scarier than what you can. …but you have to read the whole thing. This is the kind of disillusionment that follows after of wave of campaigning run like a game of catch-phrase. I’ve had to turn off the news; I cannot stomach the AM frequencies. I know more about Sarah Palin’s wardrobe than I know about Sen. Obama’s association with Bill Ayers. It’s a joke. And this election season has finally worn out its welcome. Unfortunate news. I stumbled onto Doctor Who when Christopher Eccleston first had the role. He won my viewership. 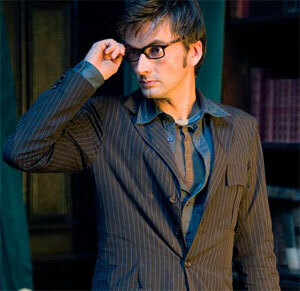 Tennant won my heart. He’ll be missed. Note to USA viewers, unless you’ve seen the latest episodes, the article contains a minor spoiler. Jeffrey Overstreet invited readers to email in and try to persuade him how to cast his ballot this year, and he was nice enough to post some of those he received. Skimming over the ones he posted (22 pages in MS Word) I noticed a thread of discontent toward Gov. Sarah Palin, even from those who said they support McCain. I’ve read a lot of the same material and seen many of the same interviews these guys have and I have to admit that I just don’t get the same vibe. I’ve noticed this thread of discontent in a few places, and in many of those, it reads like pure disdain. So I wanted to share this brief piece from Fred Barnes at The Weekly Standard. A media person I know dismisses her as “a journalism graduate of the University of Idaho.” This is pure snobbery. I asked him to name his favorite president of the past 60 or 70 years, and he chose Harry Truman. Truman never went to college but became a pretty good president nonetheless when he succeeded FDR after only a few weeks as vice president. Governors who run for national office automatically face questions about their inexperience in foreign affairs. Ronald Reagan did. Bill Clinton did. So did George W. Bush. Had Obama picked Virginia governor Tim Kaine as his veep, Kaine would have been hit with those questions. If McCain had chosen Minnesota governor Tim Pawlenty (as he came close to doing), Pawlenty would have faced the same doubts. So the qualms about Palin’s experience are merely par for the course. I like Sarah Palin. I feel no shame in liking her, and I won’t lose a wink of sleep if she finds her way to the White House. This was written in 1995, but I found it timely, considering this is what a particular person running for president has indicated he’d like to see happen. Kevin Smith’s endorsement, I’m sure, sets the nerds all a twitter, but I am still not convinced. Like I wrote on Overstreet’s blog, early reactions from a few who say they’ve seen bits of the film sound promising, but many of these are the same people that once promised me The Phantom Menace was going to be genius. Dir. J.J. Abrams is a talented storyteller, and the team he’s assembled to reboot Roddenberry’s baby are some of the best writers working today. I want to believe, really. I am just not there yet. An new series coming to NBC, Kings will tell the story of David and Saul set in a fictionalized, present day “kingdom” of Gilboa. “Kings” takes place in a modern-day kingdom named Gilboa, and its shining metropolitan capital of Shiloh. It is ruled by King Benjamin Silas, the nation’s much-loved monarch, who unified several warring territories to found Gilboa many years ago. They have since built a proud and prosperous nation. While not a perfect society, the kingdom is a beacon of hope and idealism. That is, until a young soldier named David slays a fearsome Goliath tank, rallying the nation… and turning the tide of history.